Located in the industrial heart of Western Sydney, our manufacturing facility covers over 11,000 square metres of an array of high tech machinery. We have some of the largest metalwork machinery available in Australia such as CNC punch and bending machines, rolling machines and laser cutting machines. Our laser cutting machines have a capacity to cut materials up to 9 metres long and 3 metres wide and we can fold, bend and roll materials up to 8000mm in length. At Ox Metal Processing, we can offer a designer range of products manufactured to your every dimension. It doesn’t matter the size of the job. 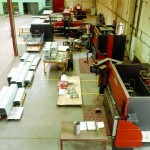 Ox Metal Processing have the capability and skills to offer fantastic results at a reasonable quote.